SINGAPORE, 5 November 2014 – The open-air car park fronting Terminal 1 (T1) will be closed for redevelopment on 12 November 2014 (Wednesday), 2.00am. Until the completion of the redevelopment works in 2018, there will be new ground transport arrangements for T1 passengers and visitors. Road signage and lane markings along the roadways leading to and within Changi Airport will guide motorists to the relocated facilities. Drivers are advised to look out for the signs indicating ‘T1 Car Park’ and ‘T1 Arrival’,and follow the directions accordingly to the relocated car park and pick-up point respectively. After parking at the new T1 Car Park, drivers heading to T1 to send off or receive passengers should proceed to the T2 Departure Hall, where they can take either the Skytrain or board a new shuttle bus service to T1. The boarding point of the free T1-T2 shuttle bus is at Door 1 of the T2 Departure Hall, beside the Krispy Kreme outlet. For passengers arriving at T1, the new Arrival pick-up point is located within a short walking distance from the T1 Arrival Hall (from the exit near Burger King). Within the terminals, airport signage will be put in place at strategic points to guide them to the relocated facilities. 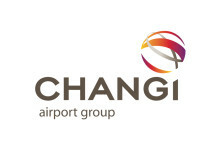 In addition, Changi Experience Agents will be deployed on the ground to render assistance to passengers. There will be no change to the Departure drop-off point for private cars and taxis, as well as the passenger boarding point for taxis at T1. The closure of the T1 open-air car park follows the completion of a dry-run (17 to 21 October) of the revised ground transport arrangements at T1. The exercise allowed Changi Airport Group (CAG) to review the operational effectiveness of its plans and identify areas for improvements. CAG would like to thank passengers and visitors for their understanding and co-operation during the dry-run. Responding to the feedback provided during the dry-run, CAG has taken steps to improve wayfinding and ensure a smoother experience for airport users after the closure of the open-air car park. 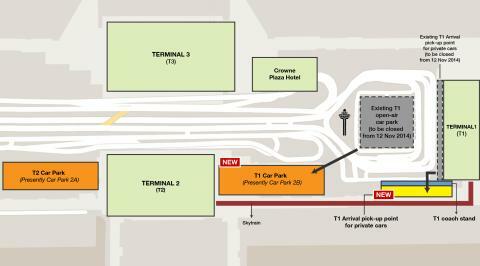 These include putting up additional signs and wall markings within the T1 Car Park, to better guide those heading to T1. More lighting and fan fixtures will also be added at various locations to improve visibility and ventilation. In addition, there are plans to install air-conditioning at the T1 Arrival pick-up point. The closure of the T1 open-air car park site marks the commencement of construction works for the expansion of T1, as well as Project Jewel, a multi-use complex that integrates facilities for airport operations, leisure attractions and retail offerings. As part of the redevelopment works, new ground transport facilities for T1 will be constructed – including a five-storey basement car park, expanded drop-off and pick-up bays, as well as more taxi bays. For more information, airport users should visit changiairport.com/T1carparkchanges. The T1-T2 shuttle bus service operates from noon to 9pm daily. The boarding and alighting point of the shuttle is the same at each terminal.